Once you begin to capture emails for your list of qualified subscribers, your next goal is to build a relationship with those subscribers and convert them to sales. Writing effective email content isn’t the only key to higher conversion. The act of sales conversion actually starts at the point on entry – the page and form with which you collect emails for your list. 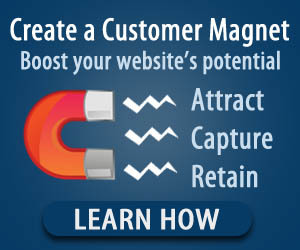 The customer magnet page that you use to capture emails must clearly define a problem or pose a question that the prospect is seeking a solution or answer for. Your product or offer is the solution that you are going to be driving them to using your email follow up sequence. If you don’t clearly define this problem – solution connection to your prospect, they may have no clue what they are signing up for and your conversion can be easily lost to confusion. By getting your prospect to understand the problem and fill out your capture email form in hopes of a solution, you are setting them up with an expectation for an offer. Prospects who are expecting a solution will be more open to your offer or product and are more likely to convert to sales. When you collect emails for your list, it is vital that you also clearly state on the landing page (thank you page) a clear idea of your offer and the solutions you are going to send them via email. This will strengthen their expectations and get them looking forward to your emails. By the time your email arrives with the solution, they will be ready to click on the purchase button. The form you use to capture emails should have a headline that defines the problem, a sub headline that offers a solution and an easy way for them to give you their information, including the ability to fill out the form using Facebook’s easy integrated button. If possible, you should even give a short teaser video about the problem to help grab their attention. Response Magic has all these features built right into their form generator, and you can give it a try for free. With the right form and approach, the way you collect emails for your list will increase your overall prospect to sales conversion rates.